Lock in a great price for MEININGER Hotel München Olympiapark – rated 8.3 by recent guests! Good facilities .very confortable during my stay . Helpful and active staffs. Near tram access. All the facilities are great! The bed was good,the toilet was so clean and eveythings was new.Location is just 15 minutes to the city by tram. I like this place, it's the most high tech hostel I've ever stayed in Europe, everything is pretty good here, and cheap. I will book again if I come to Munich again. Female 4-beds room has its own bathroom. Breakfast isn't excellent but good enough. Easily accessible from all parts of the city by the team which is 3 minutes walking from the hotel. Staff was friendly, helpful. Rooms very cozy and very well maintained. Would definitely recommend for solo travelers as well as for families or groups of travelers. It is a really modern building with all good facilities . Nice staff , really helpful . Nice events in the evening on the bar ! Very clean, friendly staff. Big well equipped kitchen for guests use. 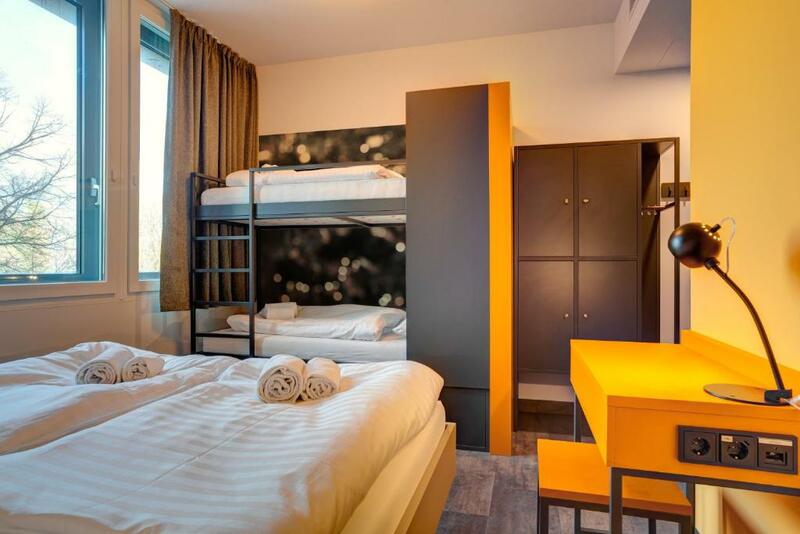 MEININGER Hotel München Olympiapark This rating is a reflection of how the property compares to the industry standard when it comes to price, facilities and services available. It's based on a self-evaluation by the property. Use this rating to help choose your stay! One of our best sellers in Munich! Located in Munich, within 1.2 mi of Olympiapark and 1.7 mi of BMW Welt, MEININGER Hotel München Olympiapark provides accommodations with parking and free WiFi. This nonsmoking 3-star hotel features a 24-hour front desk with ticket service and a terrace. All rooms at the hotel are soundproof and come with a seating area and a flat-screen TV with cable channels. The private bathrooms include a shower, free toiletries and a hair dryer. A continental breakfast buffet and packed lunch are available each morning at the property. The hotel bar offers a variety of drinks on a daily basis. Bikes can be rented at the hotel for a surcharge. Guests can enjoy a game room and billiards, prepare meals in the shared kitchen, and use the washing machine and dryer. Nymphenburg Palace is 2.2 mi from MEININGER Hotel München Olympiapark, while Old and New Pinakothek as well as Pinakothek der Moderne are within 2.5 mi of the property. The nearest bus stop and tram stations are next to the hotel. Munich Airport is located in 23 mi distance. When would you like to stay at MEININGER Hotel München Olympiapark? This single room has a soundproofing and seating area. This family room has a soundproofing, seating area and cable TV. This family room features a seating area, soundproofing and flat-screen TV. House Rules MEININGER Hotel München Olympiapark takes special requests – add in the next step! MEININGER Hotel München Olympiapark accepts these cards and reserves the right to temporarily hold an amount prior to arrival. AC did not work and windows cannot be opened. Unacceptable heat in the room. Staff was inexperienced and not the friendliest. One thing is the location, but it's very near the tram stop, took like 10 more min to the central part of Munich, so not bad either. But if you want to buy something from supermarket better do it in the central, I've heard there is a supermarket nearby but I didn't find it. The hostel's restaurant only have drinks, no food. If you arrive late at night, you won't find anything to eat except if you order something by telephone or internet. There are not a lot of restaurants nearby, but there is a italian one not that far that was good. The hostel was perfectly clean. It's beautiful, design and the girls that were in my room were very respectful and calm, so I had a good night of sleep, even if I was with strangers. The Lights in the room wasn't working leading to inconvenience in early hours of morning. It would be great if there were lockers in the room!